and help exacting organisations achieve more from their LV infrastructure. the entire Compact NSX range. offering new performance in a remarkably compact device. The Compact NSX range is innovative - it incorporates monitoring and communication functions, from 40 A upward, combined with impeccable protection. > Very high breaking capacity in a very small device. > Exceptional fault current limitation for extended system life. 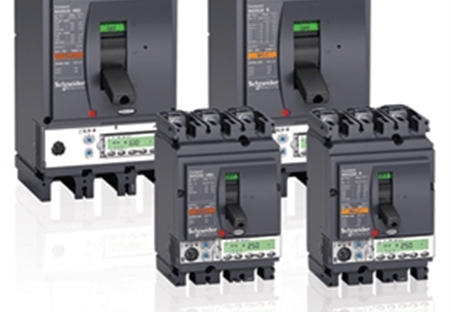 > Total discrimination is ensured particulary in the case of miniature circuit breakers for considerable savings at the time of installation. > Smaller devices mean more economical switchboards for a significant impact on overall cost of installation - no need for over-calibration. > 25 kA - Standard low short-circuit level applications, e.g., in service businesses. > 36-50 kA - Standard applications (industrial plants, buildings, and hospitals). > 70-100 kA - High performance at controlled cost. > 150 kA - Marine ready, with an Ics rating meeting IACS requirements for emergency, essential, and MCC loads. > 200 kA at up to 440 V - Industry-leading breaking capacity for high-density applications in oil and gas extraction and processing, mining operations, metals and minerals production, and data centres. > 100 kA from 500 to 690 V - The world’s highest rated breaking capacity for the most demanding electrical environments, and ideal for high-efficiency, cost-effective 690 V systems. > Well adapted to motor-starting solutions up to 315 kW at 400 V, providing protection against short circuits, overloads, phase unbalance, and phase loss. > Set up additional protection systems for starting and braking with the motor running, reverse braking, jogging, or reversing in complete safety. 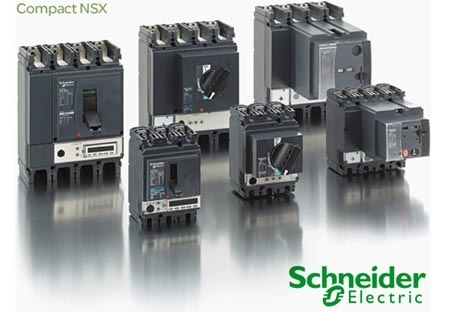 > Used in conjunction with a Schneider Electric contactor, the Compact NSX provides Type II coordination for motor applications.